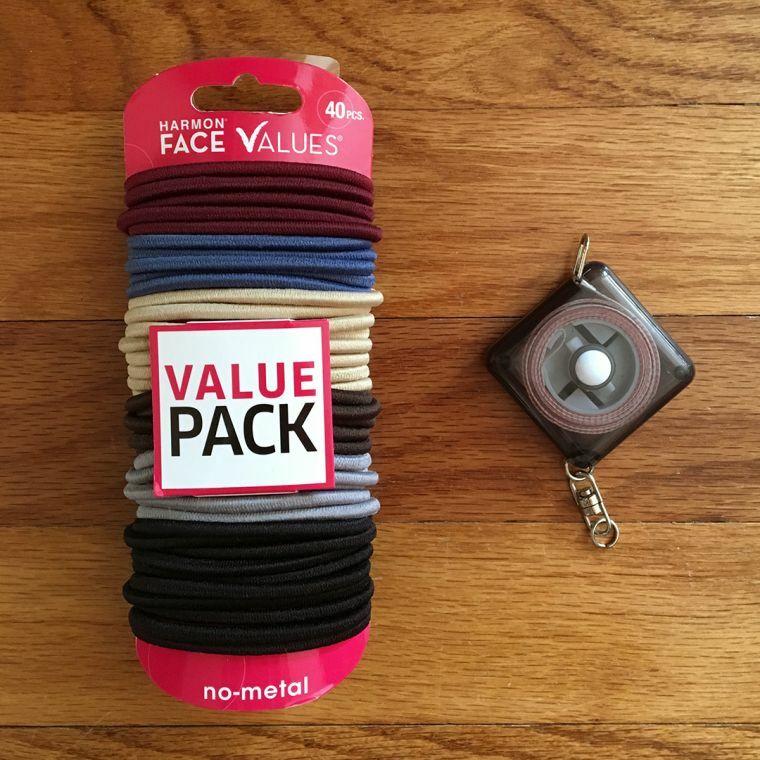 We all know the feeling of being stared down by that beautiful mat holder for sale in the lobby after a yoga class. 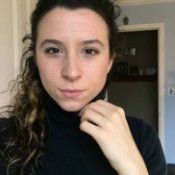 We also know the feeling of wanting to create something totally one-of-a-kind with our own hands. 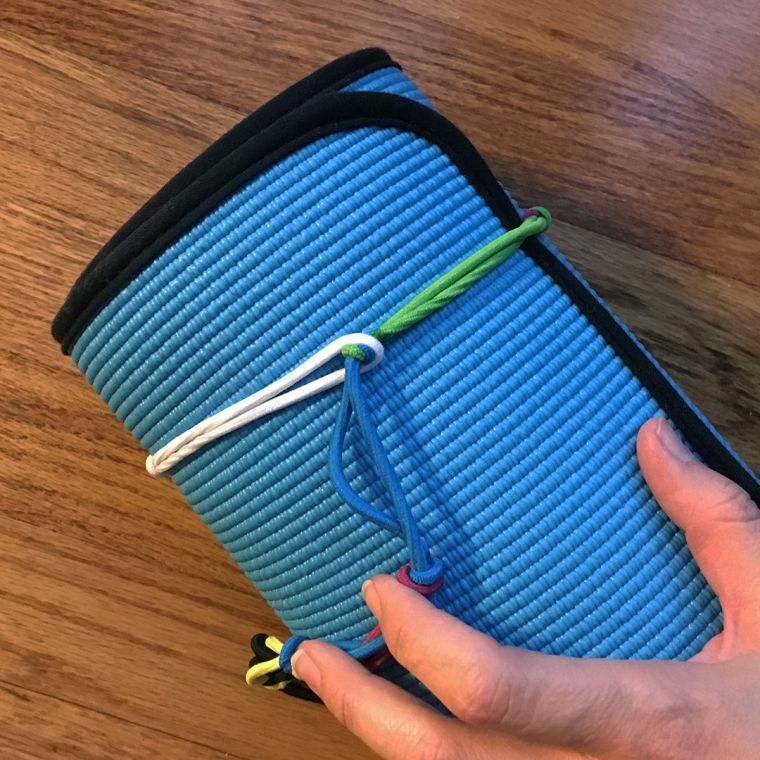 So we’ve put together two tutorials that will show you how to use hair ties (aka ponytail holders) to make super-fun mat holders for under $10! 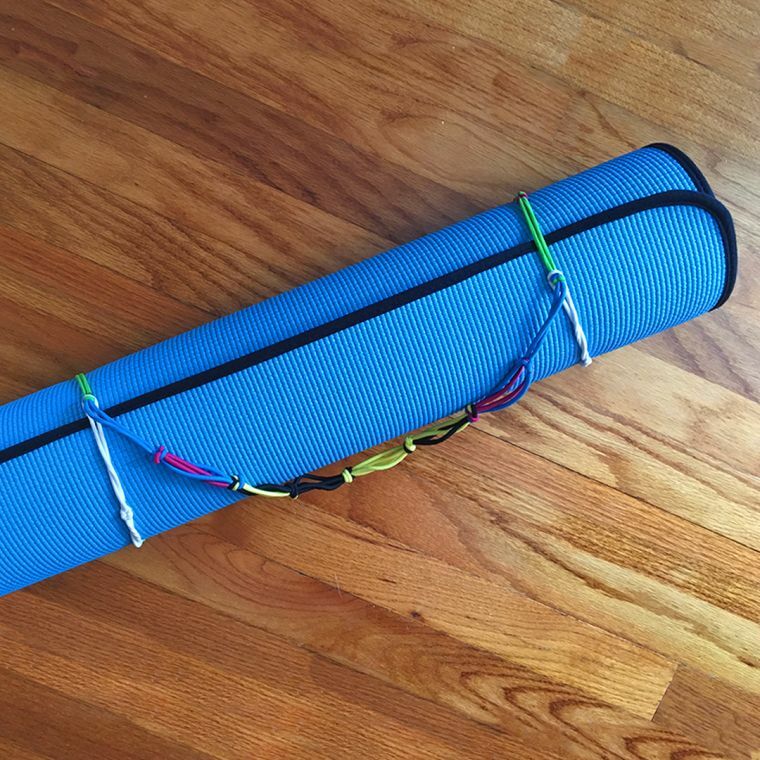 Are you a suburban yogi with a yoga mat in the back of your car at all times? 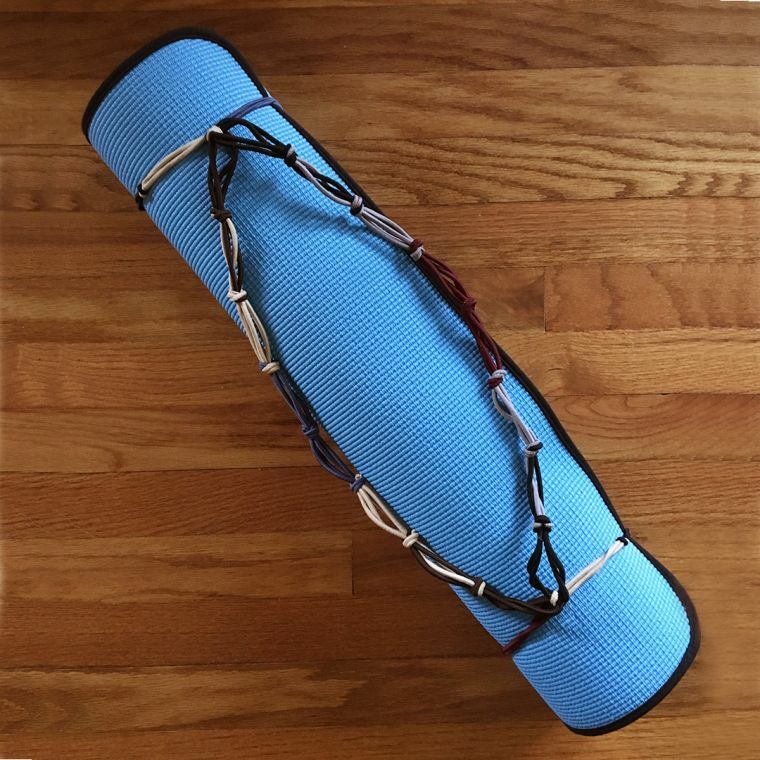 Our body wrap strap will secure your mat across your back or over your shoulder when walking from car to class. For the urban yogi who walks or bikes to class, we suggest our hands-free backpack. 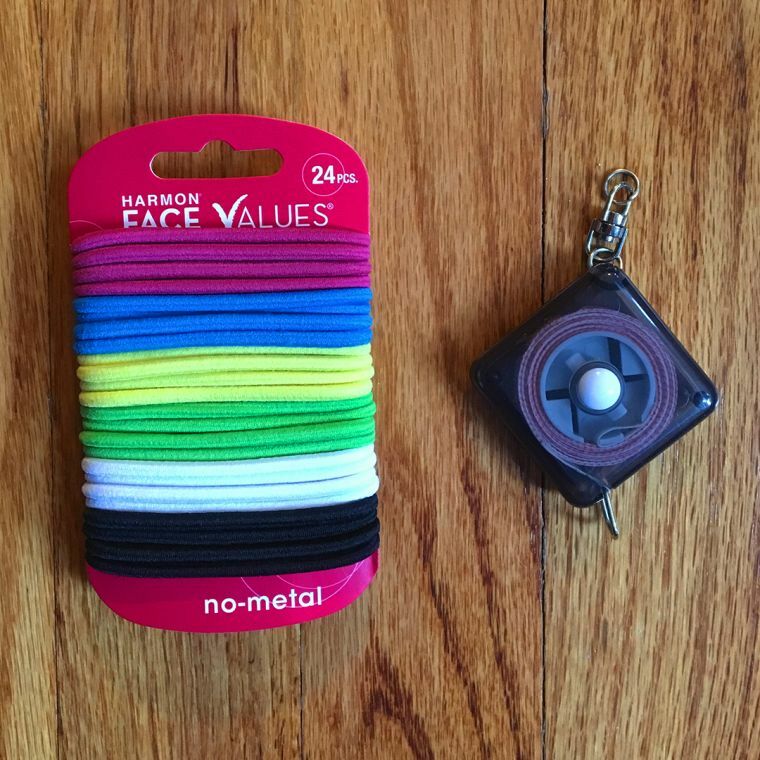 Either way, have fun creating a colorful mat holder that represents your uniqueness. 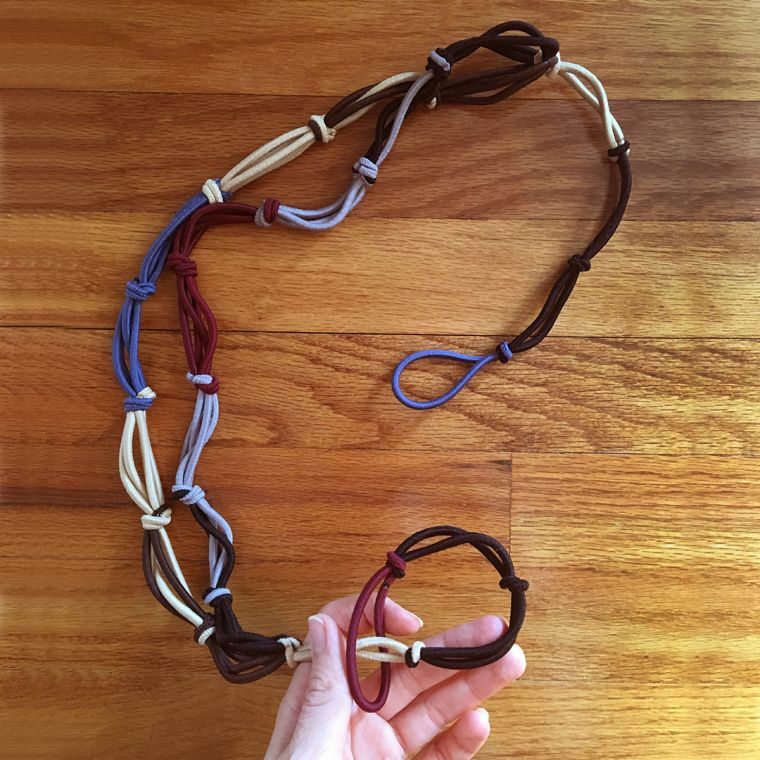 Step 1: To create a strap that will be long enough to allow you to throw your mat over your shoulder or secure it across your back comfortably, you’ll need about 18 hair ties. 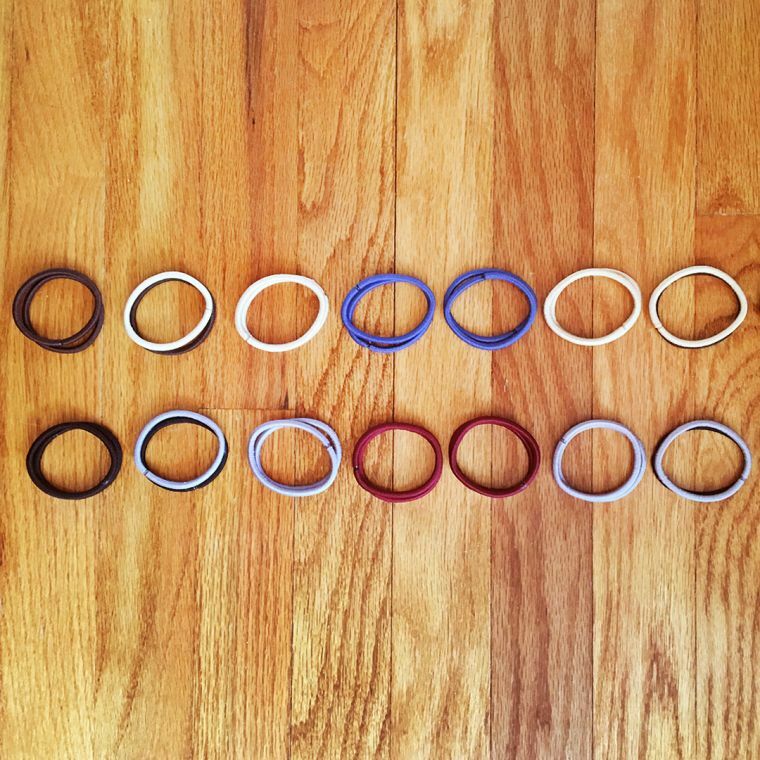 Line them up in a color pattern you like. 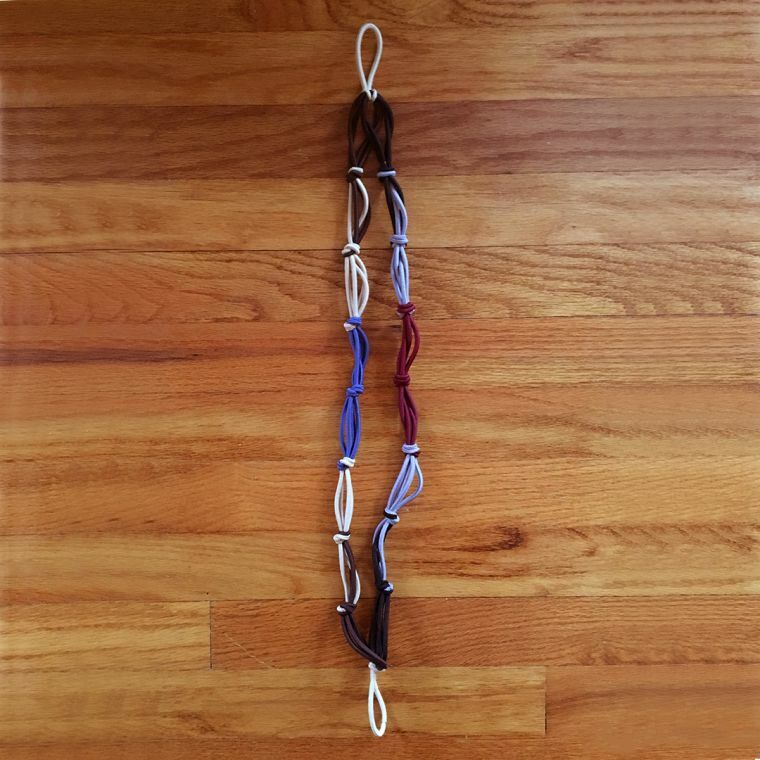 I suggest doubling up on the middle six ties to strengthen the strap. 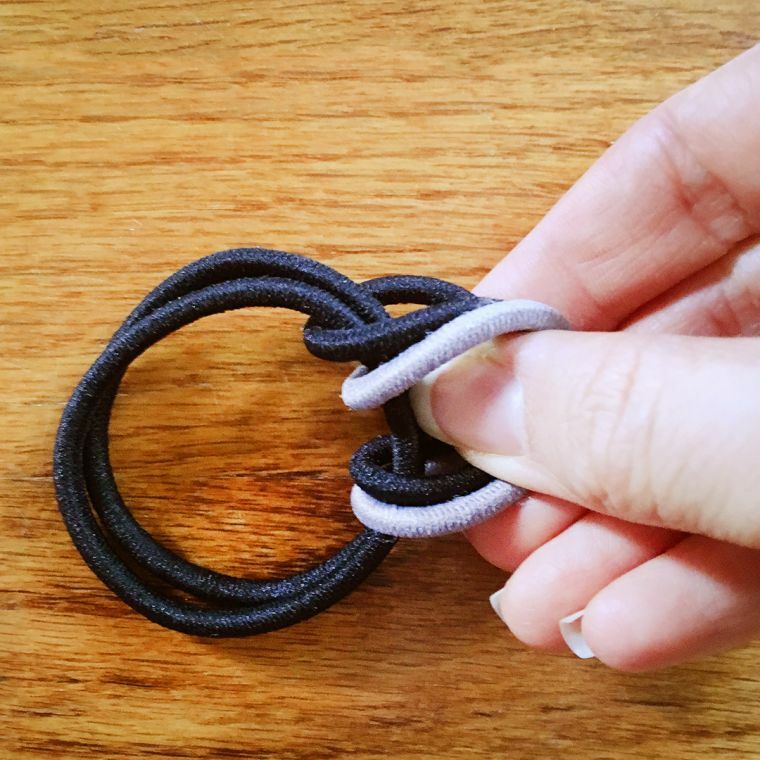 Step 2: Loop the first and second hair tie together by folding one around the other and threading one end of the folded tie through itself to make a knot. 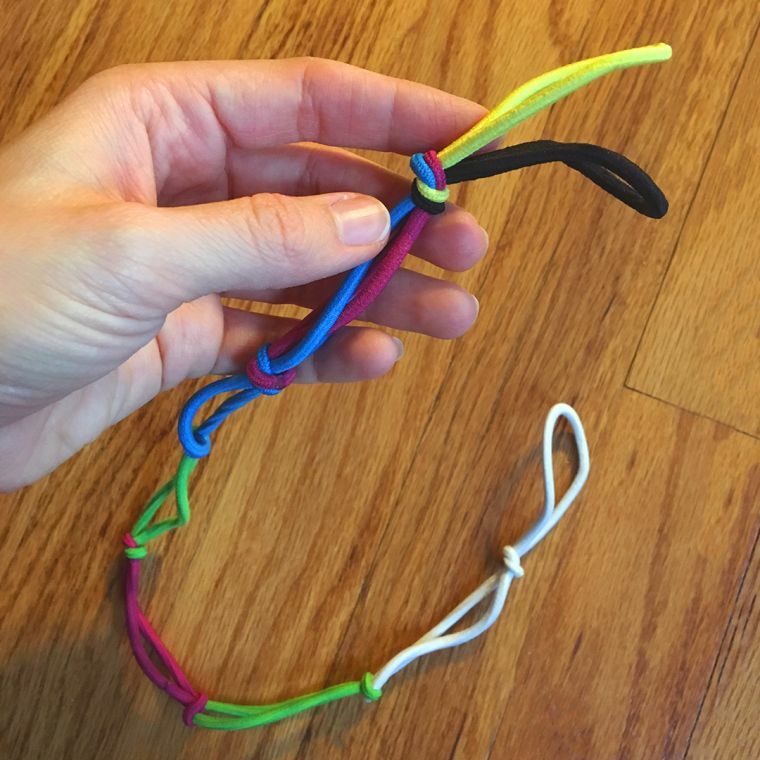 Then continue looping and connecting ties until you’ve got a strap about 40-inches long. Note: When you reach the doubled-up ties, treat them as if they were one tie, folding two over two, etc. 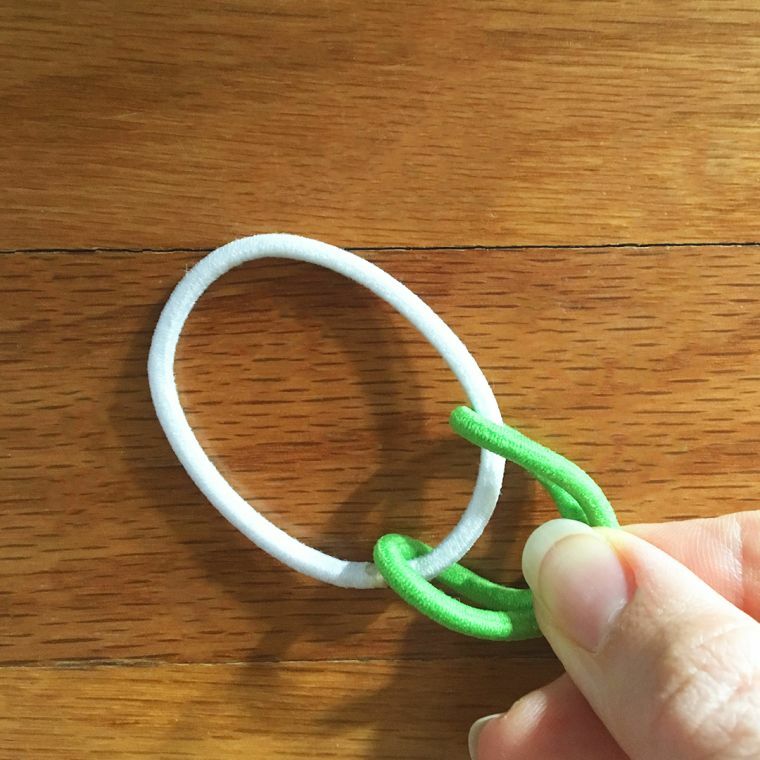 Step 3: After admiring your work, pull the strap through the last hair tie to make a large ring. 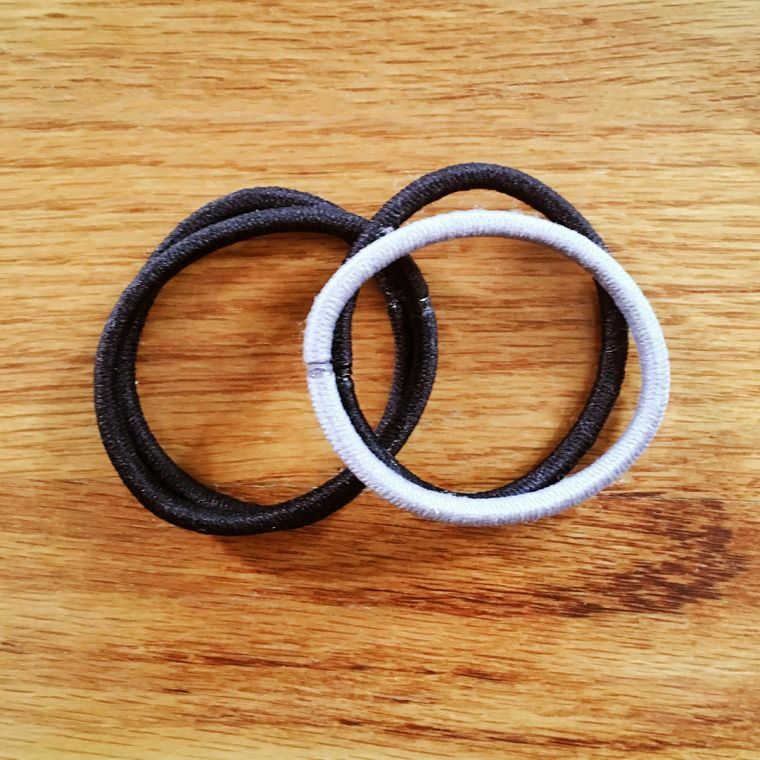 Step 4: Fasten the ring around your mat, securing the end of the last hair tie over a large knot on another tie. Repeat on the other side. 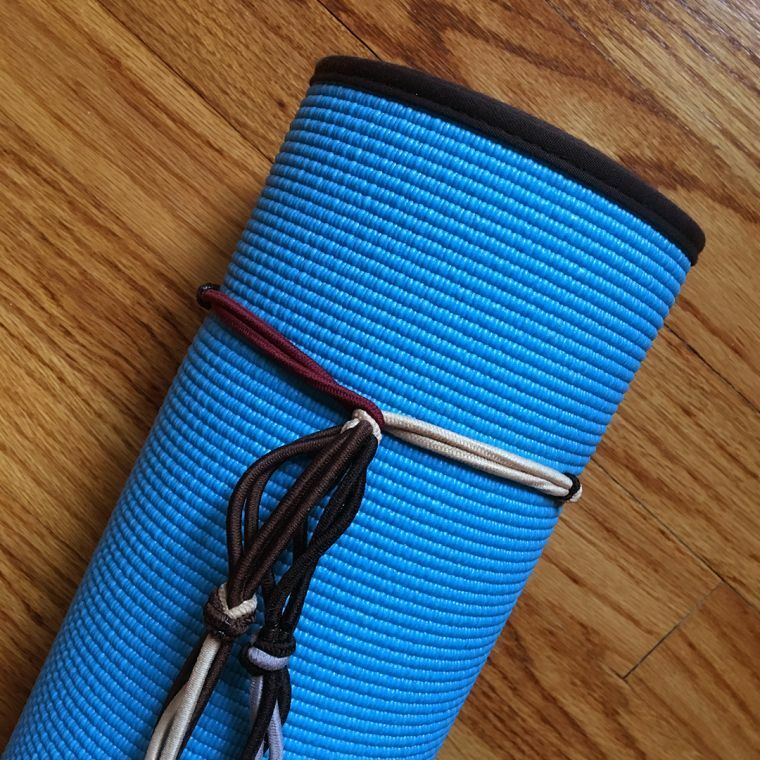 Step 5: Now you have your very own one-of-a-kind strap for your mat! The best part is that you can adjust as you please. Too long? 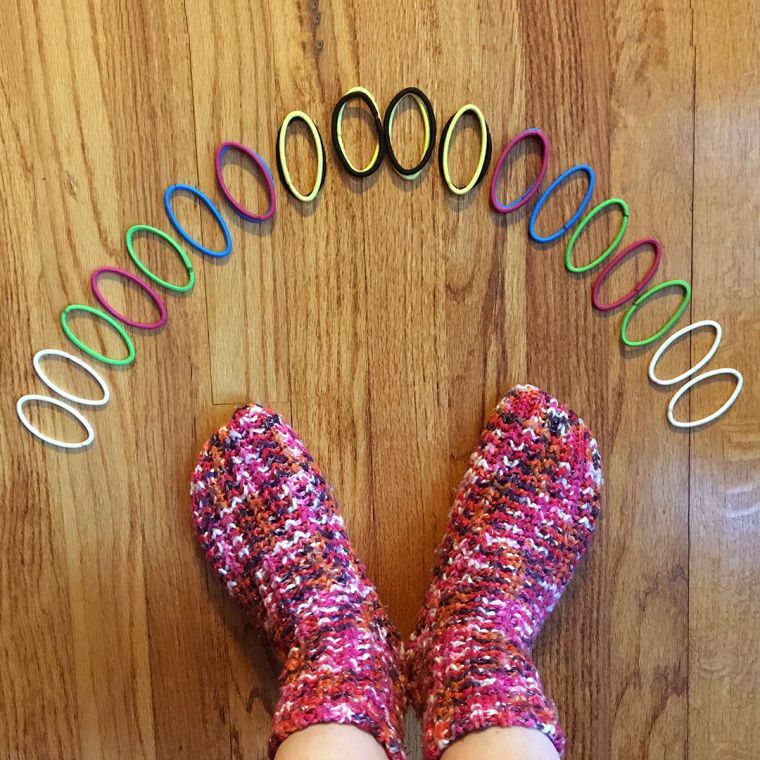 Unknot a few hair ties. Too short? Add a couple. 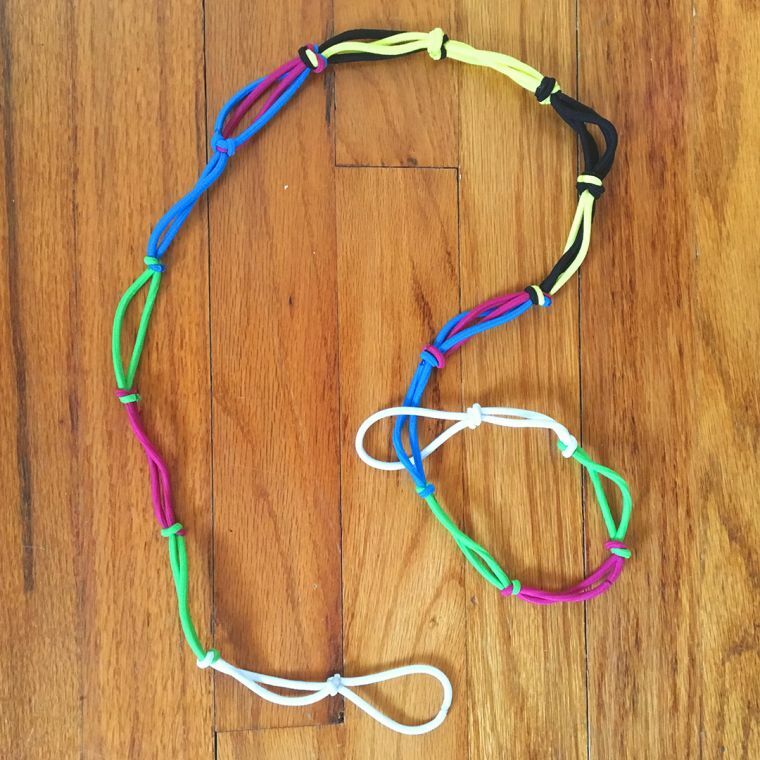 Step 1: Start by laying out two rows of eight hair ties each, doubling up each row for extra support. Go crazy with the colors! Step 2: Loop together the first row. Repeat with the second. Each row will be about 18 inches long when you finish. 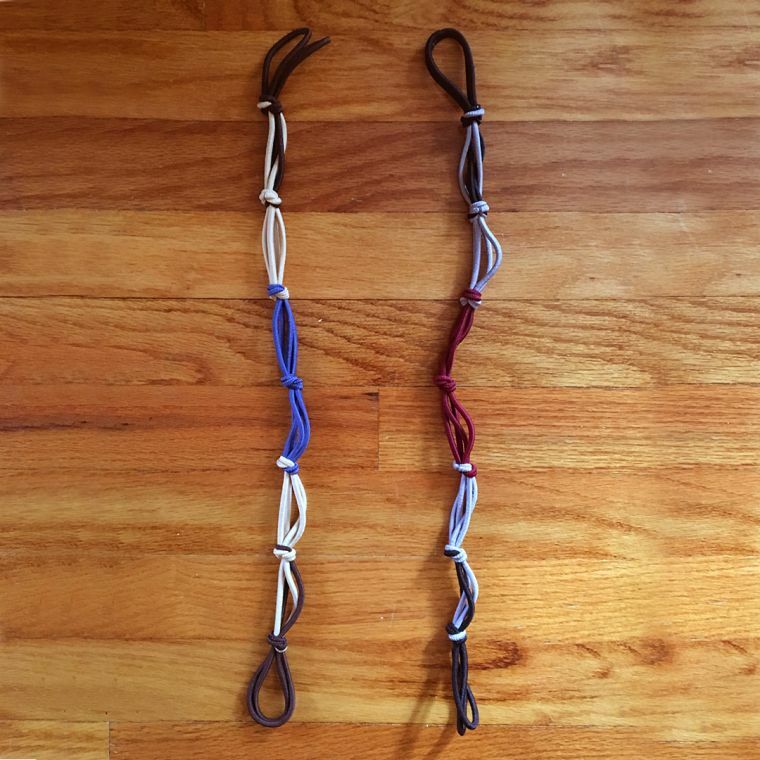 These are the straps of your backpack. 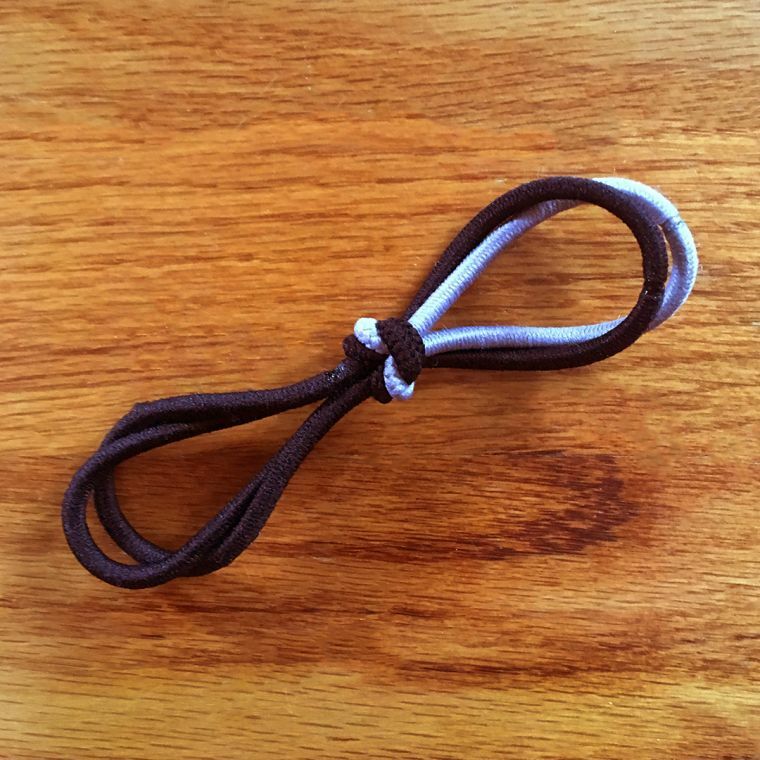 Step 3: To join the straps, loop a single hair tie through the end ties of the two straps on both ends. Step 4: Starting from the tie joining the two straps, loop about four more hair ties to each end of the straps. 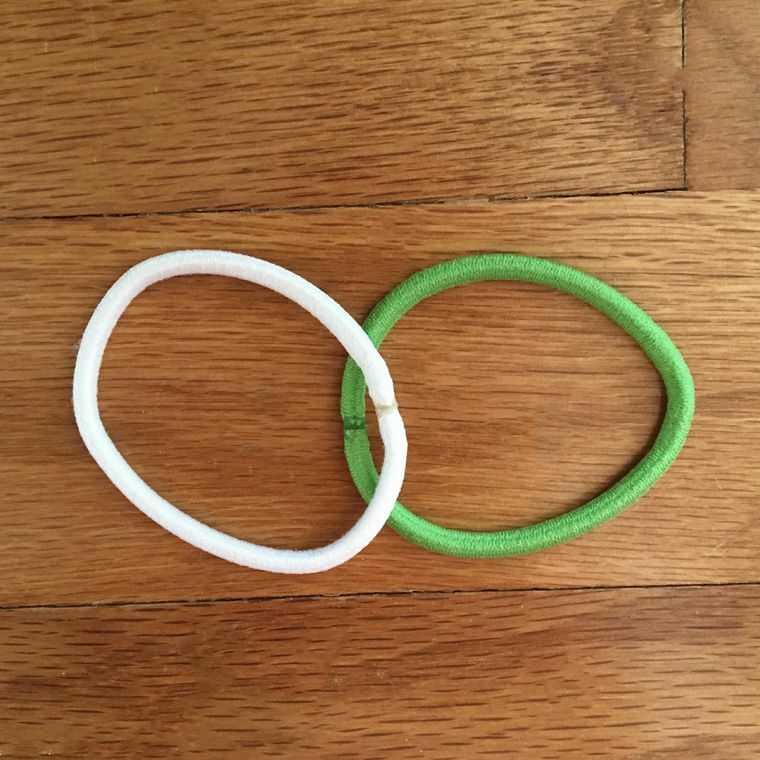 These will become the rings to hold your mat. 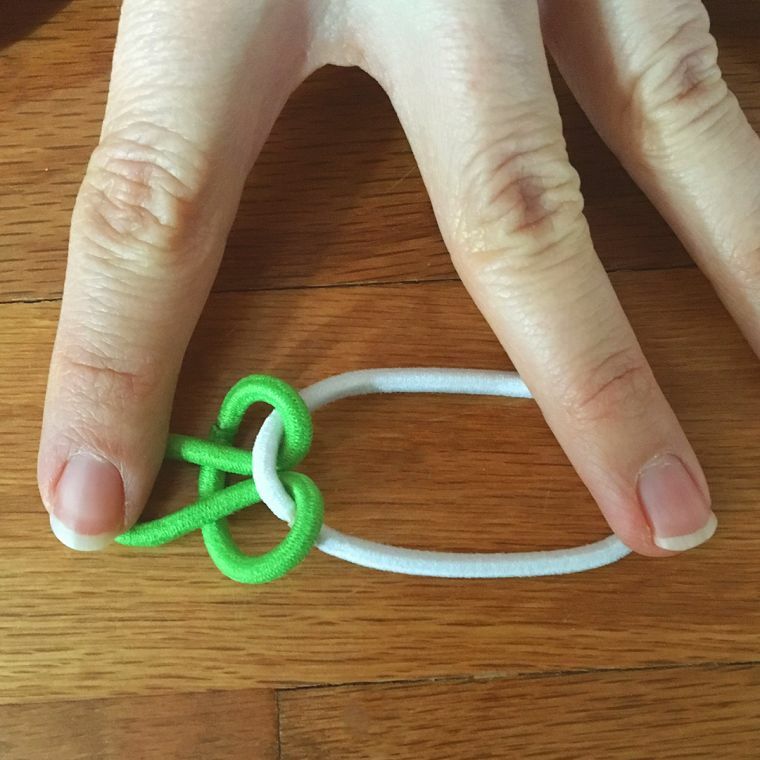 Step 5: Take the last hair tie and loop it over the string of ties, creating a ring where your mat will go. 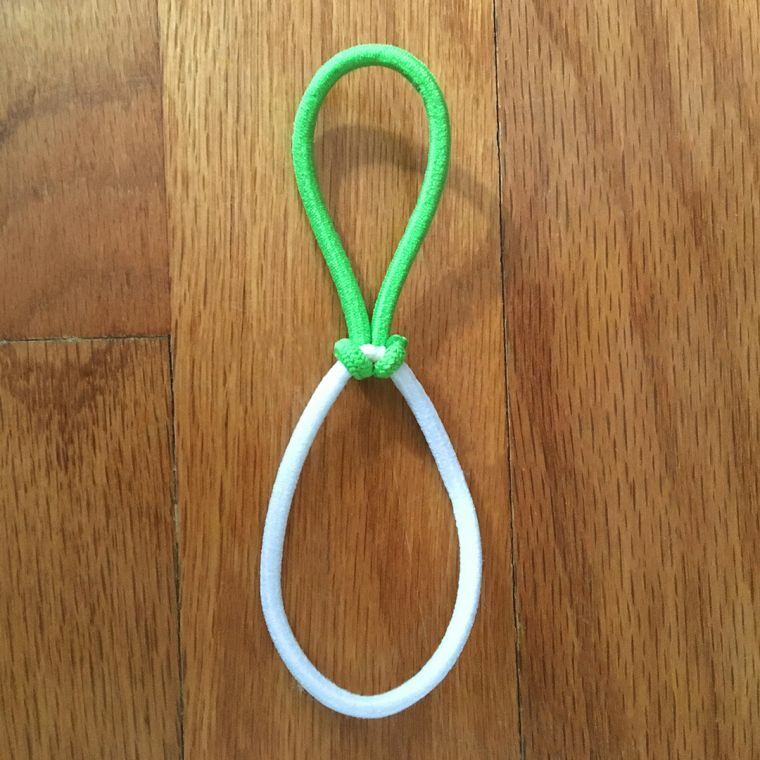 Step 6: Slip one end of your yoga mat through the ring, looping the end of the final tie over a large knot to secure it. Repeat on the other side. Step 7: Strap that baby on your back and enjoy! And remember, it’s easy to adjust the strap and ring size as needed.